Magnum Single Phase Submersible Pump Panel Compact is a powerful controlling device for your submersible pump made with heavy duty components, which protects the pump from hazards caused due to over-current. 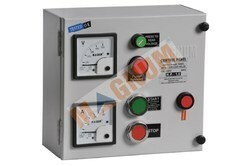 Rugged MaCH/MaK-1/MaU Contactor with wide voltage band (140-220V). Fitted with MaCH/MaK-1/MaU type relay for reliable overload protection. Powder coated enclosure for corrosion resistance & sturdiness. Rugged MaCH Contactor with wide voltage band (140-220V). Rugged MaK-1 Contactor with wide voltage band(140-220V). Rugged MaU Contactor with wide voltage band (140-220V).